More than a Container. Design to Help Practical Self-Control. Pill Box with Tamper Resistant Lock for practical self-control. Tamper Resistant storage of Pain Pills, Medical Marijuana, Fentanyl Patches, Methadone Bottles, Sleeping Pills, Narcotic Pain Medicine including PRN Medications. With the e-pill Kitchen Pill Safe all you do is put your pain medications or regular medicines inside the clear bucket, set the timer (in Minutes, Hours, Days from 1 minute to 10 days), close the lid, and you are locked out until the interval timer reaches zero. 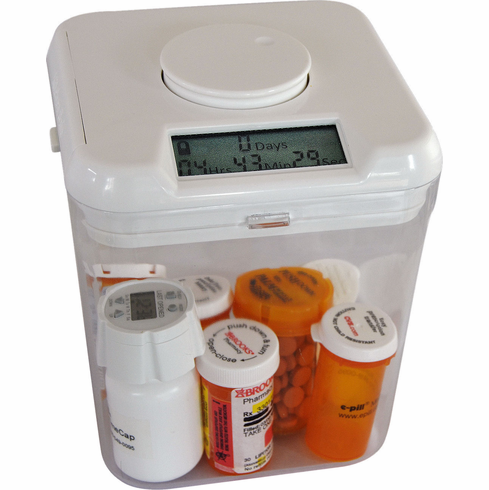 Place your medications / items in the e-pill Kitchen Safe (heavy duty Plexiglass container). Set the Timer Rotate the dial to desired Interval Time (Minutes, Hours, Days). Maximum is 10 Days. Press Dial to activate the lock. Keep your medications (or other items) safe from kids, grandchildren, people working in your home, college roommates. The tamper-resistant plastic is built using durable plastic and the walls are about 3 times thicker than your typical plastic container. As I had hoped, it has made pain management for my illness much more palatable. After I take pain medication, I lock the pill bottle away and set the timer for the time of my next dose. Since I am a "glass half full" kinda gal, I then know I only have to deal with the pain if/when it returns for (as of now, for instance), four hours, nineteen minutes, and thirty-one seconds! A. H. uses it to help moderate her medication intake. The e-pill Kitchen Pill Safe is constructed using high quality, BPA free, food grade materials. Size: 8" (high) x 6 1/4" x 6 1/4"